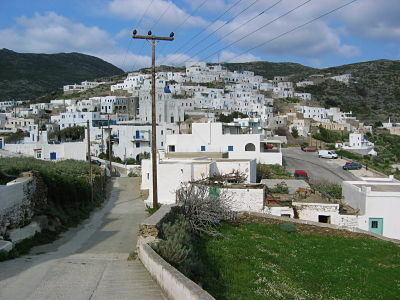 This 1238 square metre plot of land is located in the beautiful village of Tholaria in Amorgos island (Cyclades) and it can issue a building permit. It is within a 3-5 minute walk from the main square in a peaceful area just outside the village. It is in the corner of two country roads in a quiet neighbourhood with a great view to the vilage. It has a direct access to the road that leads to the port of Aigiali and to the golden-sun beaches of the area. The distance from the sea is 3kms. The price could be subjected to negotiation.